Influenza made it into our home this year, and it gnashed its ugly teeth. I have been out of commission since last Tuesday night (Jan 16th), while this virus has been taking its run at me, and winning.. Sadly it also got my little boog, Eve, and she has been trudging through this hell week with me making it on love, snuggles, supplements and a whole lot of iPad and movie time.. The symptoms for Influenza A consist of fever, chills, muscle aches, cough, congestion, runny nose, headaches, and fatigue and most typically attacks the lungs, nose and throat. Most common remedies for Influenza consist of rest, fluids and anti-inflammatory pain relievers. In some cases if you get to an emergent care facility early enough in the infection they may supply you with tamiflu which may or may not cut down length of time the virus is active. There are many ways to help boost your immune system during flu season. Being a holistic practitioner I wanted to share some of the practices we take to fight off such an illness. Going to your chiropractor for wellness care is step one and is more preventative than reactive. Not having ideal nervous system function could prolong your illness and decrease your body's ability to recognize foreign invaders. Your body is taxed by the stress on the system when you are ill that may result in muscular tension as well as misalignment of the spine. Your local chiropractor can help you beyond neuromusculoskelatal problems (more on this in another blog post). Based on their area(s) of focus they will be able to help you learn how to fuel your body with correct nutrition and complex supplements. First off I'll start by saying a fever is not a bad thing. It is one of the body's first lines of defense against a foreign invader. One of the main goals of a fever is to use the muscle to warm the bone in order to leach Calcium to cells (more on this below). We had to monitor Eve's temperature closely because even with giving her infant Advil (to help manage the aches as much as the fever) her temperature did not seem to want to fall (come to find out this was because it was infant Advil and she was on the very end of the weight scale for the infant version). This is when you need to be the most careful. When you give a child medication and it doesn't control the temperature is a very good sign your next stop could be emergent care. That being said, most parents are concerned of their children going into seizures, called febrile convulsions, however these do not harm the central nervous system(brain and spinal cord). These muscle twitches are caused by hypocalcemic tetany, which really means muscle twitch due to low blood calcium. We took several supplements to help combat this virus as is took its course but I want to touch on one in particular, Calcium Lactate. Calcium has many functions in the body, many know how important Calcium is to bone health, but it's also a big component in cell membranes, membrane permeability and cell signaling (communication). Calcium is also needed to activate white blood cells which are defenders of our blood and protect against things like viruses. By increasing the amount of free Calcium in the body, it decreases the necessity of the fever to pull Calcium from the bone. Of course always be pushing fluids to help prevent dehydration. What you put in your body during this time period is very important as it will fuel your body or it will fuel the virus/bacteria. My wife was kind enough to make a homemade bone broth chicken soup that was loaded with nutrients, including vitamins, minerals, and antioxidants to help boost the immune system. One of these days in the near future I'll write another blog post solely on the benefits of bone broth. Jess, my wife, did not get the flu. I do believe she was the carrier though. She had just returned from Kansas City from photographing a wedding the day prior while both my wife and daughter spent the same amount of time in the airport and flying, my daughter came down with Influenza two days after I did. How you ask can she be a carrier and not contract it? She had Influenza serveral years ago and her immune system did exactly what it was supposed to do. When you've contracted a virus your immune system creates antibodies that help identify, tag and warn the body that a recognized invader is within your system. These antibodies can lie dormant for many years slowly decreasing in numbers, only to be increased with "boosters" (coming into contact with the virus again), until they are needed again. 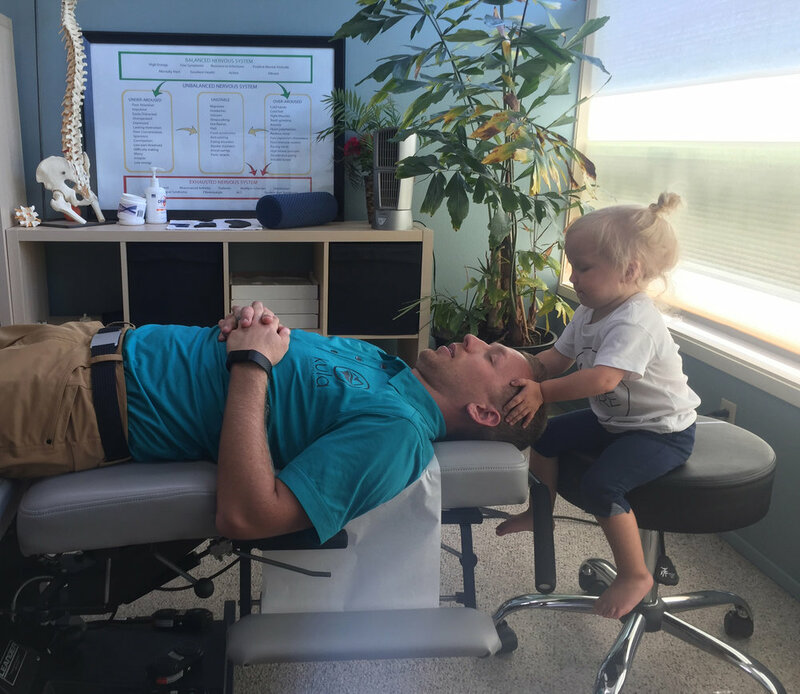 This innate memory, I'm at least nearly certain, including fueling her body correctly, having regular chiropractic care, keeping her nervous system at optimal health, helped to protect her from Influenza this year. Elderberry has strong antiviral properties known to fight respiratory infection and flu. It helps to regulate immune function and prevents that virus from replicating. Our favorite elderberry juice comes from Mindfully Made located near our home town in the midwest! You can learn more about their process here. Standard Process Congaplex contains vitamins A, C, calcium, and magnesium to help support immune system function. If you're struggling to get supplements into your children we often add them to food pouches, or bone broth. The flavor is often lost in the food and make getting them down much easier. I recommend having this in stock at all times as it can be one of the best to introduce early into an illness. (As an alternate if you cannot get your hands on Congaplex a common mixture to help boost the immune system is Vit C, zinc, rose hip oil, and echinacea). A review of several studies performed showed that Echinacea reduced the odds of a cold by 58% and cut the duration anywhere from 1-4 days. Now, I don't know about you but I think if I can even have an inkling at those numbers, its worth a try. You can find Rose hip in the SP supplement. Rose hip has a higher concentrate of vitamin C than oranges. Echinacea has been used for over 400 years and was documented by the Native Americans as a commonly used herb to remedy many illnesses. There are many benefits to our overall health outside of cutting the likelihood or length of time you may get or have a cold. Your gut health has a much larger role in your overall health than you may realize. Maintaining a healthy balance of good gut flora and introducing new strains by the use of probiotics (we use Prosynbiotic, another Standard Process product) is a great way to help keep your GI in good health. By having a balanced Gastro-intestinal(GI) tract your gut can absorb nutrients and put into the body what it needs better. To finish up, it's a good idea to stay away from sugars as these fuel bacteria and viruses and don't fuel the cells and support that your body needs to fight off its attacker. Maybe those Gatorade sound pretty good to replenish lost nutrients and enzymes, but at the cost of the added sugars may be doing more harm than good. Bone broth is a much better alternative. You can also take a look at Pedialyte which has double the Sodium and Potassium as well as Zinc and Chloride to replenish the balance missing in your body. The flu season can last all the way into May. These are some simple steps to take and keep in mind over the next several weeks to help shorten your illness or help prevent you from contracting Influenza A as well as other illnesses such as the common cold. What are some go to remedies in your home to help combat Cold and Flu season? Comment below! If you have underlying health concerns, compromised immune system, pregnant, or experience adverse reactions to any illness, please see your primary care or seek emergent services.